A pickup can be added at additional cost. These are strung high-g, but can be changed to low-g by request. We build a lot of instruments with Myrte - we love that it is local but also because of it's predictability, consistency and wide variety of color & figure. I pulled this set down one day and Aaron happened to be looking over my shoulder and said, "Wow! You have to take that & do something very special with it!" It went into the Vault stack immediately. It looks like the flame of a candle so I'm hoping that the owner of this instrument will keep that light going for a long time! The sixth instrument in our Secret Vault Series is built from one of our favorite & most rare woods - Blue Pond Myrtle - sinker Myrtle that had been submerged in a pond for who knows how long, dredged up & dried. This particular set has absolutely stunning curl and is a perfect example of why we find it so fascinating. There's something very sentimental about it because when I sand it, I love that is smells swampy and I'm transported back to the early days of Mya-Moe when we'd just gotten some of it & were trying it for the first time. This one is a duplicate of an early MG Blue Pond Myrtle that we made for Gordon's daughter Jenny. See all configuration details. This little sweetheart is PRETTY IN PINK! For our eighth instrument in the Secret Vault Series, we paired this dense African hardw ood with our local Port Orford Cedar as we did with our first build with Pink Ivory. As you can hear when Aaron plays, this combination yields a rich, smooth & vibrant tone. I understand why instrument builders like Bocote - it is a dense hardwood, perfect for back & sides and it's visually stunning! This baritone is all that and more. Topped with densely figured Bearclaw Sitka Spruce, this baritone delivers our deepest Mya-Moe voice with playability that's as smooth as silk. 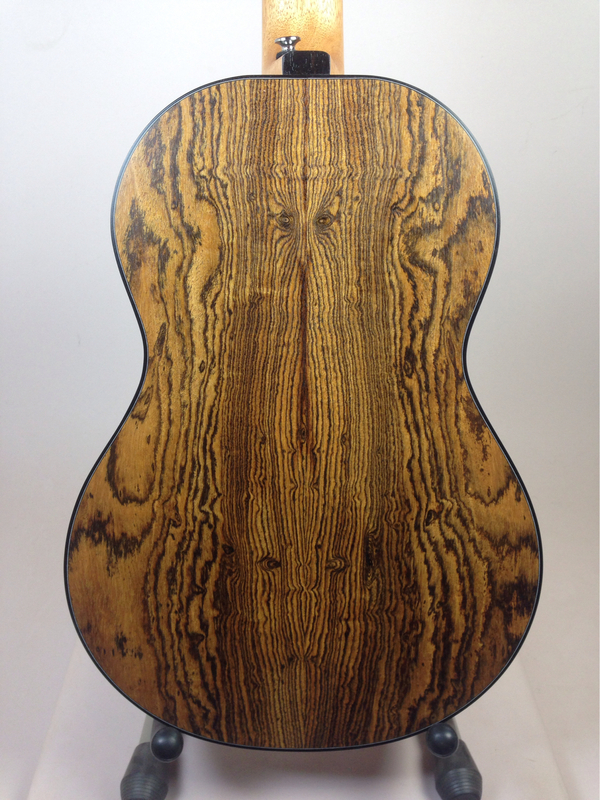 We won't be adding Bocote to our lineup, so this is the only one of it's kind in the Mya-Moe family. So if you're gunning for unique, here's your shot. Cocobolo is a true Rosewood and while it's not impossible to find, it falls into the category of woods that are quickly becoming scarce. I found a source for this wood and stocked up with as much as I could afford, since it's also quite spendy. In the sets I acquired, there are some that we'd call "jaw-dropping" and those few found their way to my stash. Amazing patterns that make fantastic book matched plates. We paired it with a sinker Redwood top to make the first Secret Vault instrument - a deep, dark tenor with an equally deep dark voice. Pink Ivory, also called Purple or Red, is an extremely dense, African hardwood. The Pink Ivory tree grows predominantly in Zimbabwe, Mozambique and South Africa. The tree is protected and sustainably maintained in South Africa, only felled by very limited permit. I've only seen pieces of Pink Ivory on wood turning supply websites and only in very small sizes. 3 years ago, I was lucky enough to run across 4 ukulele sets of this rare wood. The first tenor we made with a Port Orford Cedar top and this combination has yielded an amazing tone, certainly proving worthy to be part of the Secret Vault Series. What can I say about Koa? 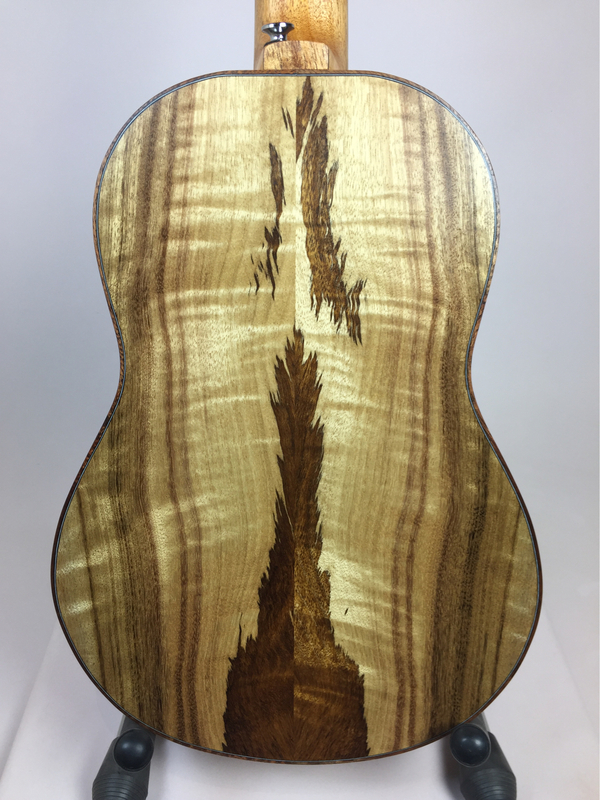 It was the wood used by early ukulele-makers because of it's local abundance and likely, it's beauty. We've made many Koa instruments over the years so it's no surprise that I've stashed a few spectacular sets away. I look back through the gallery and see many that would qualify, but these 2 are the last from my all-time favorite Koa board. Back in 2010 while visiting one of our wood suppliers, we found 3 billets of what he called Blue Pond Myrtle - sinker Myrtle from a tree that had been submerged in a pond for who knows how long, dredged up and dried. It looked pretty drab, gray & dull. Shortly after that, we made the first instrument from it for Ben Lovett of Mumford & Sons. Working with it was interesting - it bends like a dream, the swamp speaks out when it's sanded and finish transforms it into a shimmer of blue, gray, green and khaki curls. It must be that the swamp has a song because the tone is soulful & full. We were in love. We built the second instrument as a Christmas present for Gordon's daughter, Jenny. While it was under construction, the Mumfords came by for a visit and while they were in the shop, they all signed it. In the following year, we build 11 more and while we still had a little left, we called the supplier to get more. None!! So, the rest of it went into my secret stash. I let a little of it go when we built our 1000th instrument. I'd intended to use the rest to build other commemorative ones but we decided to start this series & it seems like the perfect place for the remaining material. I have around 6 sets which will be used for tenors & super sopranos, so I can maximize the use of it. This one is precious! As you can tell from cruising through our gallery of completed instruments, we love building from Myrtle. One of my wood suppliers introduced us to what he called Chocolate Heart Myrtle the very first time we met him. The patterns created when some of this wood is bookmatched are so interesting. Naturally, some of these have ended up in my stash. I labeled a few of them the "Butterflies" and another is a 1-pc top & back that are the remaining pieces from the board we used to make #500. So look for Myrtle to be well-represented! The drippy veins of black over the creamy maple-colored background in this wood make me think of a Salvadore Dali painting... or a Rorschach test! Eyes, bats, wings, faces - what do you see? This wood naturally makes it into the Secret Vault. As you would imagine, this variety of Ebony is just like it's silky black sister we use for our fingerboards & bridges - incredibly dense. It's not very easy to work with, being quite stubborn for bending and eating up sandpaper at an alarming rate. But it's wonderful when paired with a responsive top like Cedar, yielding a big, rich tone. Eye candy. Ear Candy. Yes, please. A lot of builders use Bocote. I only have one set of Bocote. I don't plan on getting anymore. We already offer so many wood options that it's hard to choose, so adding and stocking another isn't in the cards. So this set is in the Secret Vault because it's the only Bocote Mya-Moe we'll ever make. Don't get me wrong - it's a stunning set! But it is special because it's the only one. Pistachio is an incredibly dense and sustainable hardwood. We have considered using it as an alternative fingerboard because of it's stiffness & durability. Aaron actually got this set of Pistachio from a potential supplier and since we aren't introducing new woods, we have decided to include it in the Secret Vault as another in the "only one Mya-Moe" category. You simply cannot believe the color and pattern in this book match! Eucalyptus is in the same category as Bocote & Pistachio - I only have one set and there will only be one Mya-Moe Eucalyptus instrument ever made. Besides that, though, this one has a special place in my heart because I got it from my Koa supplier on our first visit to his shop. He suggested we use it to build ukuleles and we took this one set. It's pink-ish in color, beautifully curly and I've always thought I'd do a Valentine's instrument with it. So yes, I'm doing it and I'm including it in the Secret Vault!